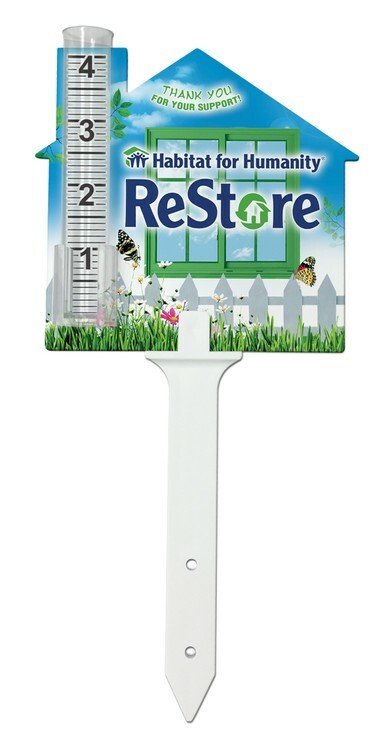 Clear acrylic rain gauge with black top and black stake. 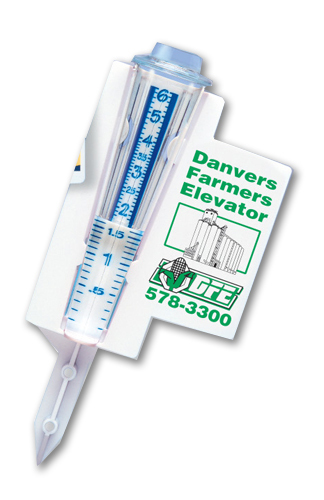 This is a great promotional item with lots of ad space. 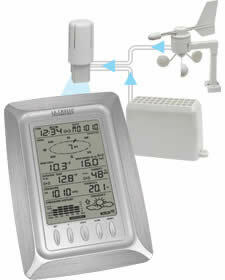 Rain gauge will hold 7 inches of rain. 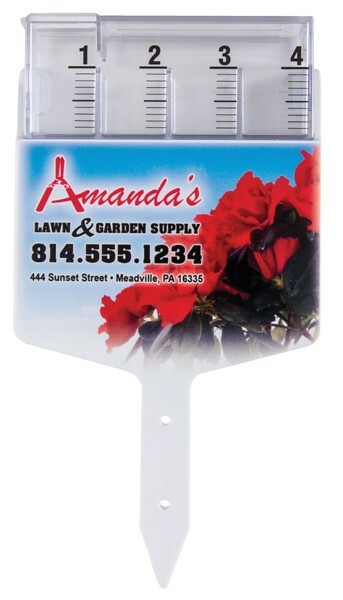 The tapered point can be inserted into the ground or it can be mounted to a post of deck with your own screws. 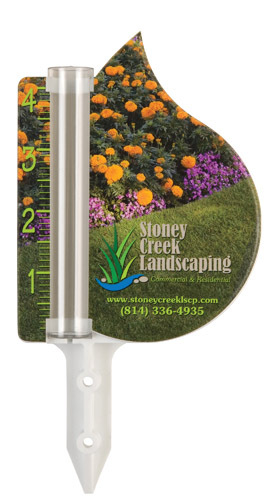 Large plastic 6" cone rain gauge. Shown with 2 color imprint. Droplet shape 6" rain gauge. White stock shown with 2 color imprint. Large plastic waterfall rain gauge. Full color digital imprint. Small droplet shaped rain gauge. Shown with 1 color imprint. Cloud shape 4" rain gauge with cumulative dial. Shown with Cumulative Dial and 2 color imprint. Small 4" tube rain gauge. Shown with 2 color imprint. 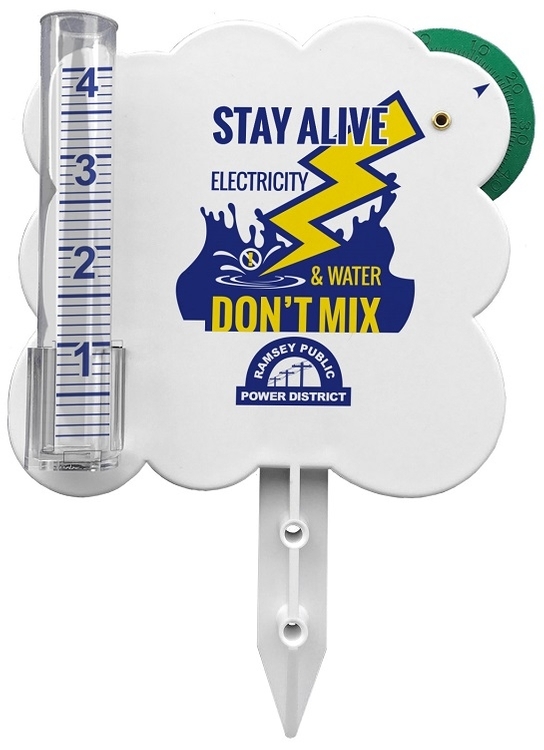 Rain Gauge Thermometer Combination with Full Color digital imprint on thermometer 6" printed tube with inch or inch/metric scale. 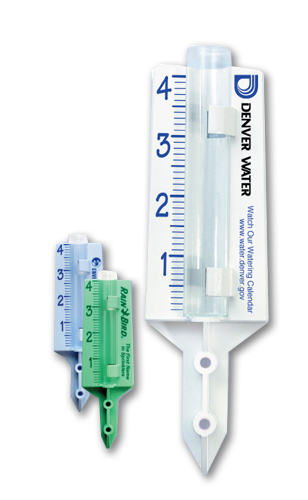 Standard scale on Rain Gauge tube - inch. 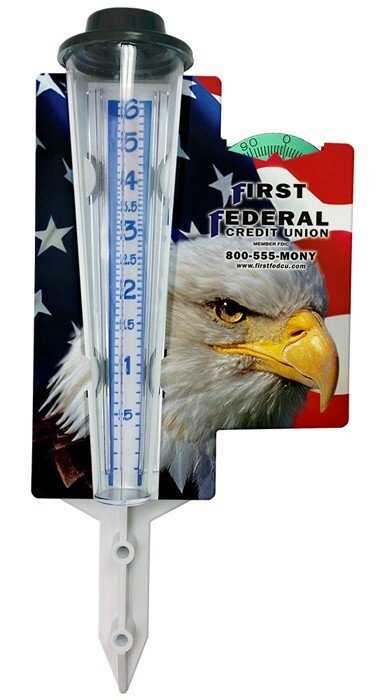 Standard scale on thermometer is Fahrenheit, Celsius available upon request. 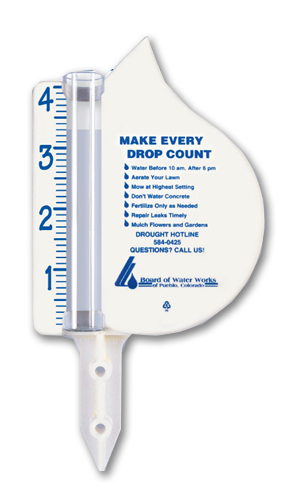 Droplet shape 6" rain gauge with Full color digital printing. Small, economical rain gauge. Recycled stock shown with 2 color imprint. 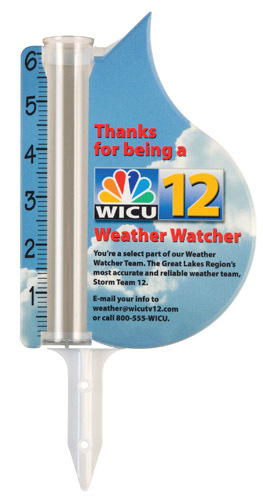 Snow gauge measures up to 12.5 inches of snow with 6" printed rain gauge tube. 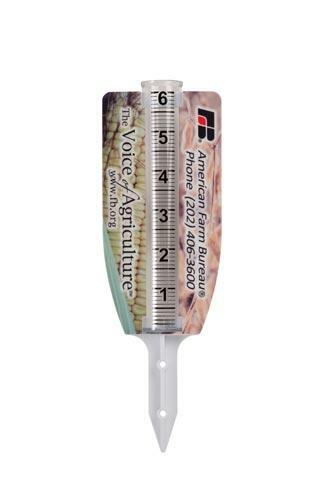 4" House/Barn shape Rain Gauge with 5.5" stake, digital full color imprint. 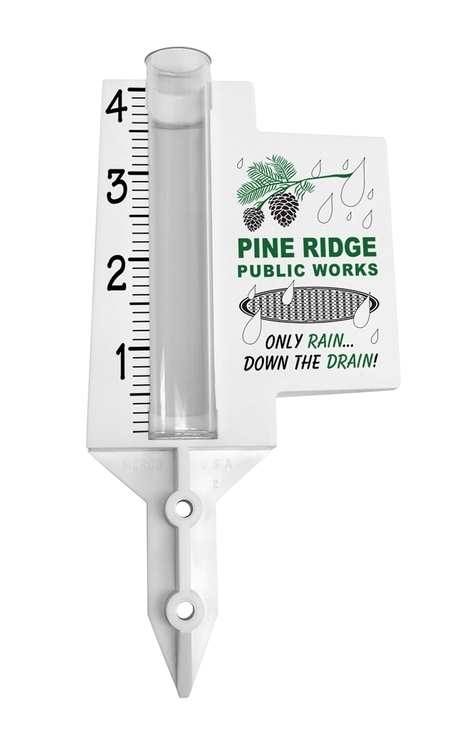 Classic Jumbo Rain Gauge with large ad imprint area. 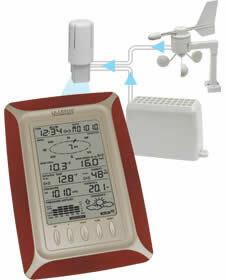 This rain gauge is a great lawn and garden outdoor accessory. It will hold 6 inches of rain. The tapered point can be inserted into the ground or it can be mounted to a post of deck with your own screws. 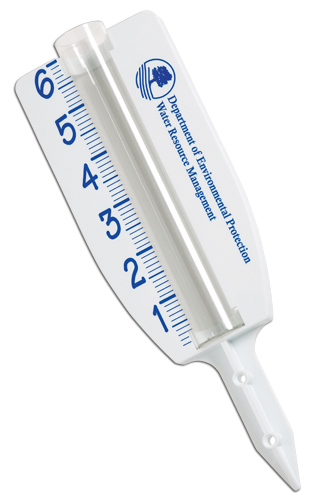 Large plastic 6" cone rain gauge. Full color digital imprint. 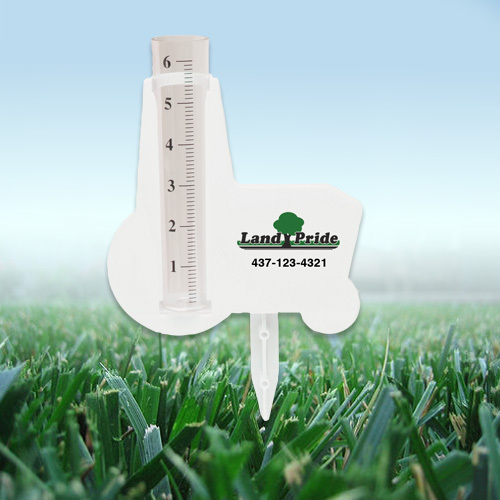 Small droplet shaped rain gauge with full color digital imprint.. 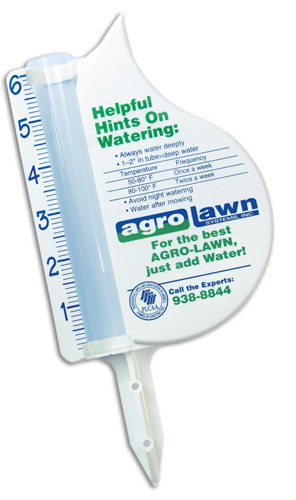 The Tractor shaped rain gauge is a great lawn & garden outdoor accessory. With a large ad imprint area, it's sure to get noticed. 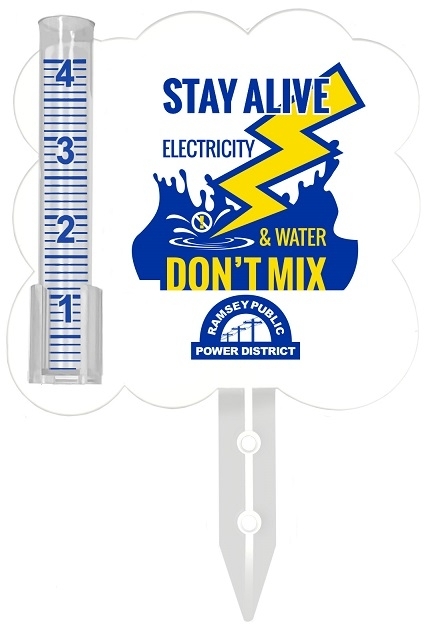 Gauge will hold 6 inches of rain. A very popular product for realtors, real estate companies, real estate agents, garden and landscape businesses, farm equipment services, and farmers cooperatives. 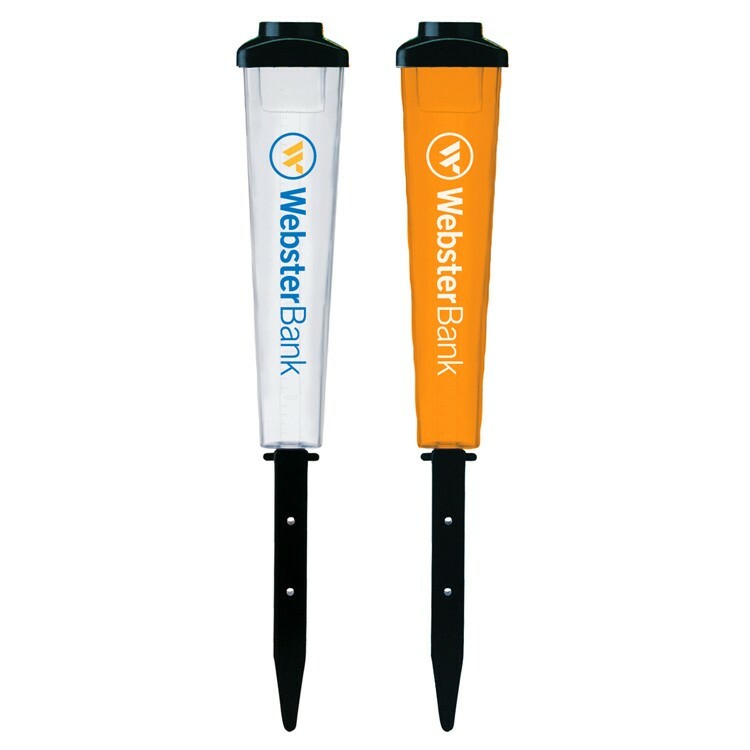 The tapered point can be inserted into the ground or it can be mounted to a post of deck with your own screws. 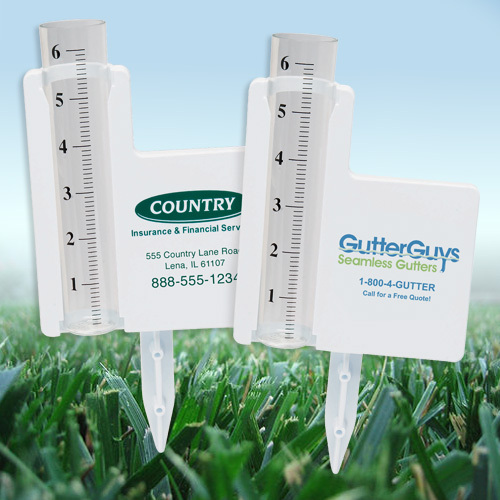 Rain Gauge Thermometer Combination 6" printed tube with inch or inch/metric scale. 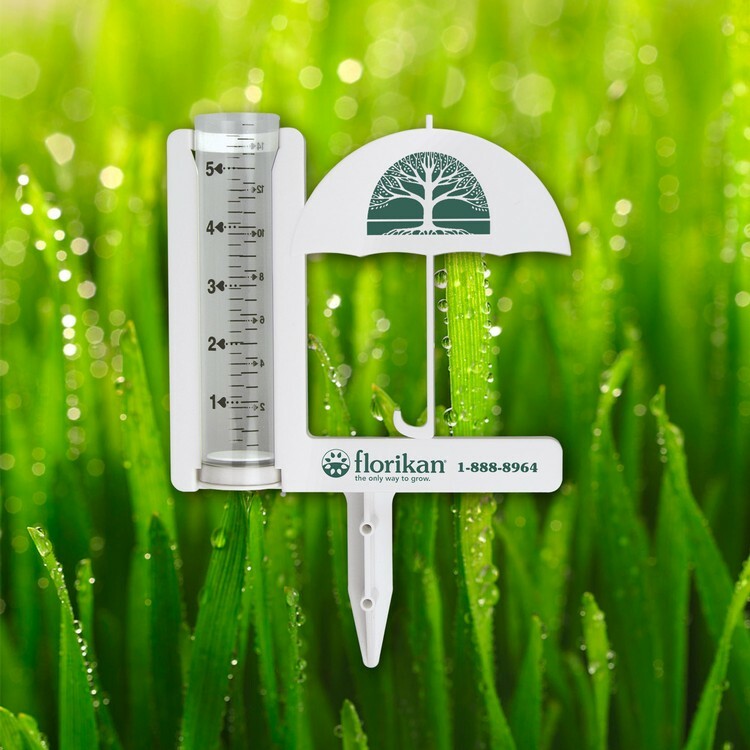 Standard scale on Rain Gauge tube - inch. 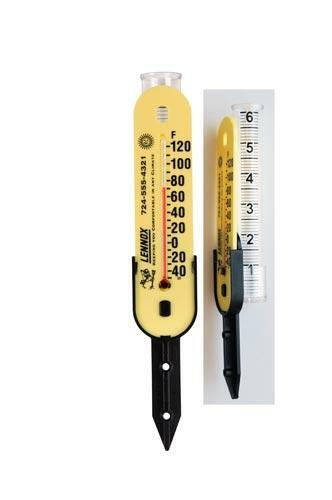 Standard scale on thermometer is Fahrenheit, Celsius available upon request. Economical 6" rain gauge. Full Color Digital imprint. Cloud shape 4" rain gauge. Shown with 2 color imprint. Large plastic 6" cone rain gauge with Cumulative dial. Shown with 2 color imprint. Large plastic 6" cone rain gauge with Cumulative dial. Digital Full Color imprint. Economical 6" rain gauge. * 5 Day available! 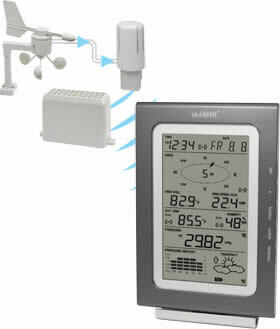 Weather resistant clear plastic allows you to quickly see and measure rainfall events up to 5". The orange marking behind the numbers magnifies the numbers for easy reading. 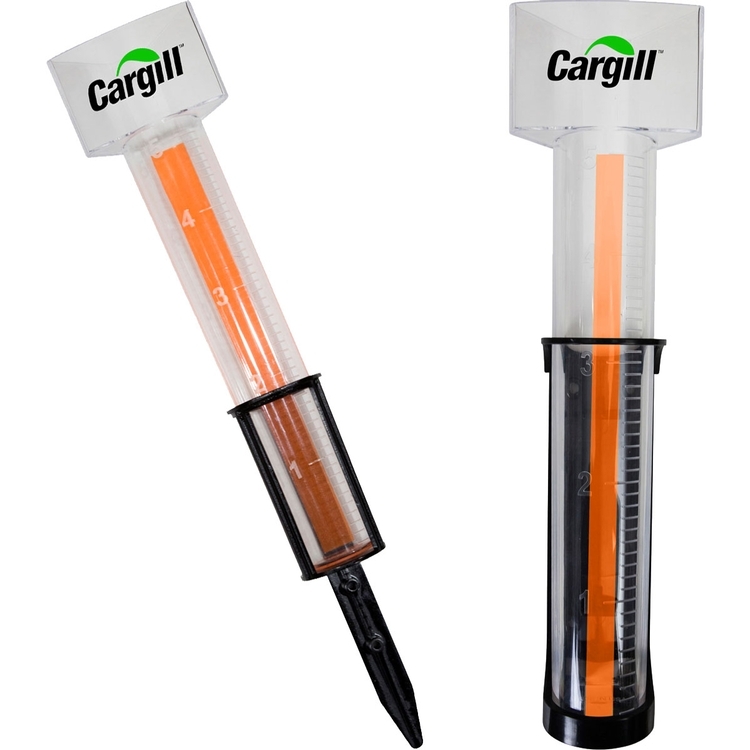 The stake can be mounted to a post with your own screws or the stake can be inserted into the ground. Stake adds 4" to the product height. 6" Rain Gauge. Shown with 1 color imprint.